The Bound Leggings is a piece of armor added by Blood Magic. 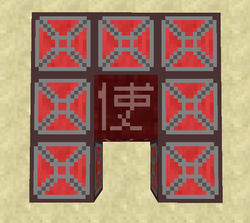 Wearing a full set of Bound Armor provides complete protection against most damage excluding fire and wither damage at the cost of 300 LP per heart. The Bound Leggings are created using the Soul Armour Forge and Filled Socket by placing them in the world in the pattern shown below. The pattern can be positioned horizontally or vertically. Then you need to make a right click on Soul Armour Forge block. As a result, Filled Socket blocks will disappear (Soul Armour Forge block is not consumed) and the created armor item will drop to the ground. Bound Leggings has no known uses in crafting. This page was last modified on 11 December 2018, at 07:27.